“A new species of Asteroschema (Echinodermata: Ophiuroidea: Asteroschematidae) from Southwestern Japan”. Species Diversity. 14 (2): 115—129. “Ophiuroids (Echinodermata) of genus Ophiura collected from deep waters off Pacific coast of northern Japan”. National Museum of Nature and Science Monographs. 39: 619—653. “Two new species of the subgenus Asteroporpa (Astromoana) (Ophiuroidea: Euryalida: Gorgonocephalidae) from Japan”. “A taxonomic review of the genus Astrocharis Koehler (Echinodermata: Ophiuroidea: Asteroschematidae) with a description of a new species”. “Molecular phylogeny of the order Euryalida (Echinodermata: Ophiuroidea), based on mitochondrial and nuclear genes”. Molecular Phylogenetics and Evolution. 61: 392—399. “A new genus Squamophis of Asteroschematidae (Echinodermata: Ophiuroidea: Euryalida) from Australia”. “A taxonomic review of the genus Asteromorpha (Echinodermata: Ophiuroidea: Euryalidae)”. “Molecular phylogeny based on increased number of species and genes revealed more robust family-level systematics of the order Euryalida (Echinodermata: Ophiuroidea)”. Molecular Phylogenetics and Evolution. 69 (3): 566—580. “A taxonomic review of the genus Astrodia (Echinodermata: Ophiuroidea: Asteronychidae)”. “A taxonomic review of the genus Asterostegus (Echinodermata: Ophiuroidea: Euryalidae)”. “Redescription of an euryalid brittle star, Astroceras coniunctum (Echinodermata: Ophiuroidea: Euryalidae)”. 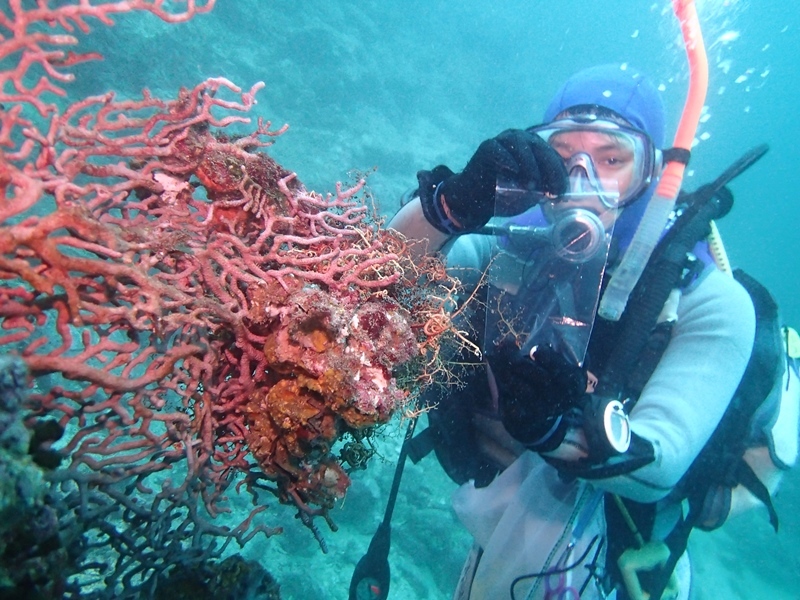 “JAMBIO Coastal Organism Joint Surveys reveals undiscovered biodiversity around Sagami Bay”. “Marine benthic community in Shirahama, southwestern Kii Peninsula, central Japan”. “A taxonomic review of the genus Astrohelix Döderlein, 1930 including the synonymy of the subgenus Asteroporpa (Astromoana) Baker, 1980 to Astrohelix”. “Non-destructive morphological observations of the fleshy snake star, Asteronyx loveni (Echinodermata: Ophiuroidea: Euryalida) using micro-computed tomography”. “First finding of anchialine and submarine cave dwelling brittle stars from the Pacific Ocean, with descriptions of new species of Ophiolepis and Ophiozonella (Echinodermata: Ophiuroidea: Amphilepidida)”. “Euryalid brittle stars from the International Indian Ocean Expedition 1963―64 (Echinodermata: Ophiuroidea: Euryalida)”. “A taxonomic review of the genus Astrodendrum (Echinodermata, Ophiuroidea, Euryalida, Gorgonocephalidae) with description of a new species from Japan”. “Description of a new subfamily Astrocloninae (Ophiuroidea: Euryalida: Gorgonocephalidae) based on molecular phylogeny and morphological observations”. “A new species of Ophioconis (Echinodermata: Ophiuroidea) from a submarine cave at Shimoji Island, Miyako Island Group, southwestern Japan”. “A comprehensive taxonomic list of brittle stars (Echinodermata: Ophiuroidea) from submarine caves of the Ryukyu Islands, southwestern Japan, with a description of a rare species, Dougaloplus echinatus (Amphiuridae)”. “Fossil gorgonocephalid basket stars (Echinodermata: Ophiuroidea: Euryalida) from the Middle Pleistocene of Japan; the first record from the Indo Pacific region”. “Ophiuroids of the order Euryalida (Echinodermata) from Hachijo-jima Island and Ogasawara Islands, Japan”. Memoires of the National Museum of Nature and Science, Tokyo. 47: 367—385. 瀬戸臨海実験所の教育と研究における分類学の重要性―時岡隆先生と臨海実習に注目して― A focus on Takasi Tokioka (1913―2001) and short training course in marine biology: The importance of the taxonomy for education and research at the Seto Marine Biological Laboratory. 分類学と古生物学の融合を考える ― Some considerations of collaboration between taxonomists and paleontologists. 分類学と古生物学の融合：現生種と化石種による海産無脊椎動物の系統分類学的研究 ― Collaboration between taxonomists and paleontologists: Taxonomy and phylogeny of marine invertebrates using extant and fossil specimens. A taxonomic review of the family Asteroschematidae (Ophiuroidea) from Japan. 13th International Echinoderm Conference, University of Tasmania, Australia (5 January, 2009). Molecular phylogey of the order Euryalida (Ophiuroidea). 7th European Conference onEchinoderms, University of Gottingen, Germany (4 October, 2010). A new family-level classification of the order Euryalida (Echinodermata: Ophiuroidea). Joint Seminar of LIPI and ACORE Program of JSPS. Main Auditorium of LIPI, Indonesia (12 November, 2012). Population structure of a fissiparous brittle star Ophiothela danae (Echinodermata: Ophiuroidea) on gorgonacean corals. NRCT-JSPS Joint International Seminar on Coastal Marine Science in Southeastern Asia. Khum Phucome Hotel, Chiang Mai, Thailand (16 November, 2013). Population structure of a brittle star Ophiothela danae (Echinodermata: Ophiuroidea) on gorgonacean corals from Gulf of Thailand. IOC/WESTPAC International Scientific Symposium. Sheraton Hotel, Nha Trang, Khanh Hoa, Vietnam (22 April, 2014). Molecular phylogeography of the euryalid brittle star, Asteronyx loveni. 2014 European Echinoderms Colloquium. Portsmouth University, Portsmouth, UK (21 July, 2014). Molecular phylogeography of Asteronyx loveni species complex. 16th International Echinoderm Conference, Nagoya University, Aichi, Japan (30 May, 2018). Shallow water reef ophiuroids (Echinodermata: Ophiuroidea) of Thailand. JSPS-CCore-RENSEA, 3rd Joint Seminar on Coastal Ecosystems in Southeast Asia, Chulalongkorn University, Thailand (21 February, 2019). 14th Internationl Echinoderm Conference, prestigious buildings of the Royal Academy of Sciences of Belgium, Brussels (23 August, 2012). Systematic revision of subfamilies of Gorgonocephalidae (Echinodermata, Ophiuroidea) based on molecular phylogeny and ossicle morphology. 2016 Joint events of the 22nd International Congress of Zoology and the 87th meeting of Zoological Society of Japan. Okinawa Convention Center (18 November, 2016). Molecular phylogey of the order Euryalida (Echinodermata: Ophiuroidea). The University of Tokyo, GCOE Retreat, University of Tokyo, Japan (5 March, 2010). ※Plenary Poster Award. Anatomical observation of the class Ophiuroidea (Echinodermata) using micro-computed tomography. 2016 Joint events of the 22nd International Congress of Zoology and the 87th meeting of Zoological Society of Japan. Symposium “Delving into Overlooked Zoology”. Okinawa Convention Center, Okinawa, Japan, 18 November, 2016.